The Garage Theatre takes its name from a reference in Pat McCabe’s book, “The Butcher Boy” – Francie’s mother has a breakdown and he says she has gone into the Garage to get it fixed! (The theatre was previously located in a disused ward in St Davnet’s Psychiatric Hospital, Armagh Road, Co Monaghan). Opened in 1992 following an initiative by the VEC, it was originally funded by the VEC, Monaghan Dramatic Society and the Arts Council/An Chomhairle Ealaion. This funding was to provide a professional theatre space. 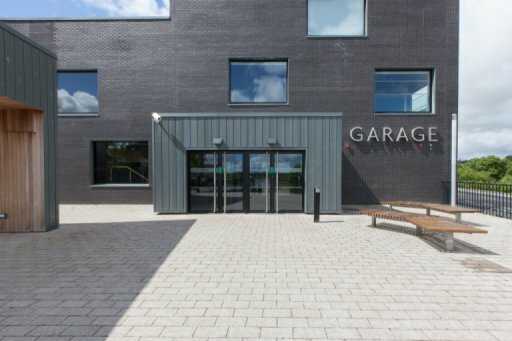 In 2013 The Garage Theatre was relocated within the Monaghan Education Campus, which is a state of the art facility located on the Armagh Road on the outskirts of Monaghan town. The theatre is under the remit of Cavan Monaghan Education and Training Board (CMETB). The Garage Theatre provides a venue for touring theatrical groups who produce a high quality of professional theatre. In addition to this the Garage also provides a space for local amateur groups and it is a resource for the local community. The Garage Theatre is renowned for showcasing comedy, dance, music, concerts and children’s entertainment. The theatre is also home to Monaghan Youth Theatre which encompasses the Junior Youth Theatre. Monaghan Youth Theatre has been recognised nationally as one of the most outstanding Youth Theatre’s in Ireland by NAYD and have produced many famous prodigies. The theatre opened with a premiere of the play – “Frank Pig says Hello” by local writer Patrick McCabe. His book “The Butcher Boy” is now a successful motion pictured directed by award winning director Neil Jordan.